If you need rings to use for a baby carrier, you want to make sure that your rings are both designed for weight bearing and are made from baby-safe materials. Rings from a craft store are NOT designed for weight bearing and should never be used as such. Rings from the hardware store have not been tested for baby-safe materials and may have weld lines which can wear your fabric unevenly. If you are looking for a local place to buy safe sling rings, check a cloth diaper shop or an upscale baby boutique. If your local babywearing group has a buy/sell/trade group, one of the caregivers there may have extras they are willing to sell as well. If you buy your rings from Amazon or elsewhere, please do so with extreme caution. Make sure your rings have been weight tested and are made from baby-safe materials. Our group does not recommend any Amazon sources at this point. Slingrings.com sells both nylon and aluminum rings. Both of these are equally safe to use and are both tested and weight rated the same. In general, most people find that aluminum rings are both easier to adjust and hold fabric better, but some people prefer nylon rings as well, especially for water slings, or in situations when you might be going through metal detectors (like an airport) and want to minimize the chances that you will have to remove the sling. 3" 3.5" 3" 3.625" Most ring slings. Good for tablecloths, wrap conversions, twill, duck, etc. Ideal for beginners or those who prioritize easy adjustment. 2.5" 3" 2.75" 3.325" Some ring slings. Good for linen, osnaburg, single layer dupioni silk. Ideal for more advanced wearers who prioritize a grippy ring that won't slip. 2" 2.5" 2.25" 3" Good for water slings made from athletic mesh. Good for onbuhimos, reverse onbuhimos, and ring-waist meh dais. Usable for toys loops or ring-waist pouches. 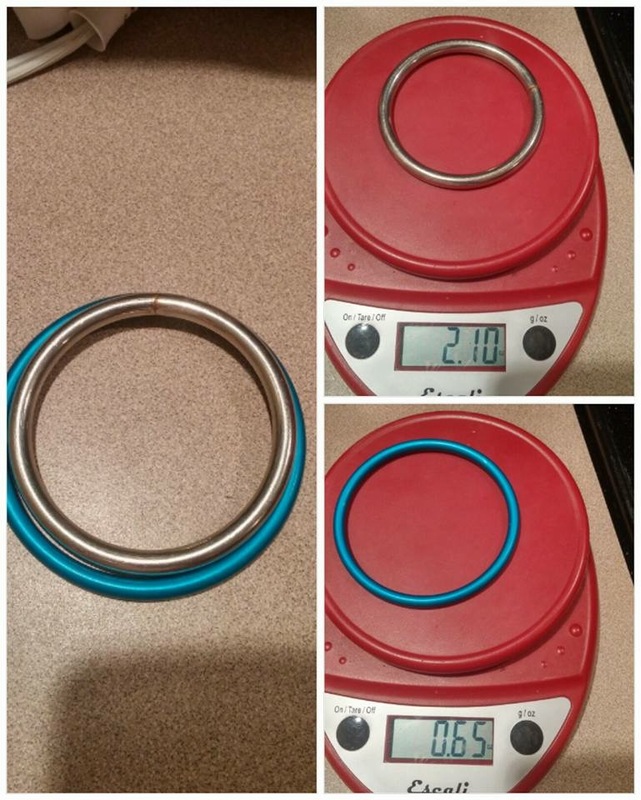 If you contact Slingrings via e-mail, you can special order 1.75" mini rings, or 1.5" super mini rings. These could be useful for things like chest "clips" for structured carriers. Slingrings.com has notoriously fast shipping (most with the "free shipping" option tend to arrive within 3-4 days) but if you simply NEED rings sooner than that, you can sometimes find sling rings for sale at a local cloth diaper shop, or ask the moms in your local moms group or babywearing group if they any have any spare rings laying around that they could sell you. NEVER use rings purchased from a craft store or fabric store. These rings are not rated for weight bearing and would put your baby in danger. As a last resort, you can use large o-rings from a hardware store. Look for large (preferably 3") rings with a very smooth weld - any kind of bump or raised texture on the weld line will wear your fabric down unevenly and could eventually cause a tear. Keep in mind that hardware rings are not made with babies in mind, so they could be chewing on just about any type of metals. Plus, as one mama in our Facebook support group shared, hardware rings are significantly heavier than official aluminum sling rings and will be much more difficult to adjust. 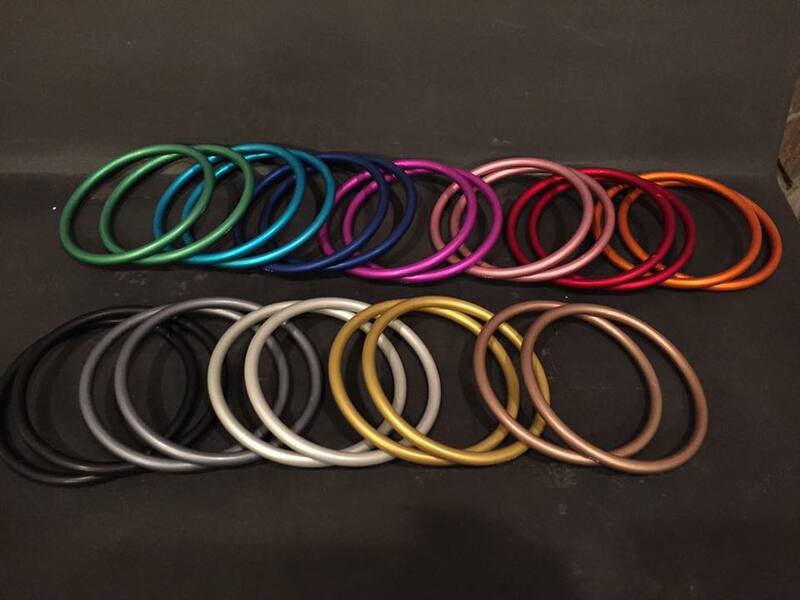 Different sources for sling rings may offer different color (for example, the UK source above offers both shiny and matte finish rings and more colors) but here is an example of the colors available in aluminum rings from slingrings.com. Keep in mind that their colors vary from batch to batch (especially turquoise, purple, and bronze) but this should give you at least a vague idea of what to expect.